Confirming an earlier report by Breitbart, the Hill reports that the Republican National Committee has decided to reinstate its support of Alabama Senate candidate Roy Moore after initially cutting ties over allegations of sexual misconduct, following Trump’s official endorsement earlier on Monday of the Alabama Judge after weeks of silence. Breitbart first reported that the RNC had decided to step back into the race. Last month Trump told reporters that “[Moore] denies it. He totally denies it — that’s all I can say”, although he did not endorse the controversial candidate until today. The abrupt reversal comes after RNC officials told The Associated Press last month that they would not support Moore even after Trump stood by him. Subsequently, the two GOP campaign groups cut ties with Moore in October, halting their financial and field support for his bid as a chorus of Republican lawmakers called on him to step aside. Their decision to break ties with Moore came after several women alleged that he made unwanted sexual advances while they were underaged minors and he was in his 30’s. While the RNC – which is President Trump’s political arm – is backing Moore now, Breitbart notes that the National Republican Senatorial Committee (NRSC), which is controlled by Mitch McConnell, is still withholding support. McConnell has pushed for Moore’s ouster after spending more than $30 million in a failed effort to beat him in the GOP primary and runoff. It remains to be seen if the NRSC will join President Trump in supporting the GOP nominee for the U.S. Senate in Alabama in the final week of the election. Voters head to the polls a week from Tuesday on Dec. 12. 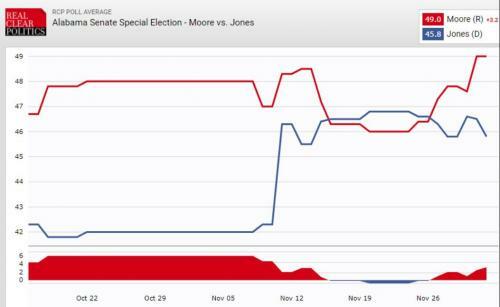 While Moore’s odds of winning took a hit after the allegations first surfaced, his standing in the polls has risen over the past two weeks., and Moore now holds a solid five-point lead over Jones, according to the latest data from RealClearPolitics. Trump initially supported Luther Strange, who was appointed by former Alabama Governor Robert Bentley to temporarily fill the senate seat previously held by now-Attorney General Jeff Sessions, in a primary race against Moore, who handily won thanks to backing from Steve Bannon. Moore is considered a hero among the evangelicals of Alabama for refusing the remove a statue of the ten commandments he had installed in the Alabama Supreme Court when he was chief justice. The Alabama Republican Party has stood by Moore, and while many Republicans in initially tried to distance themselves, their fervant opposition has since died down.